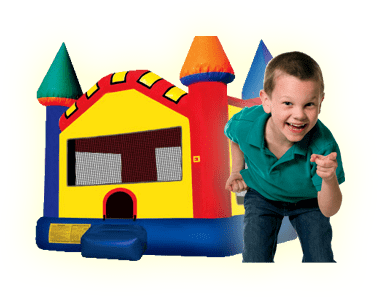 Here, you'll find a number of the most frequently asked event rental questions that we receive at Bounce Houses R Us. While we understand this list will not cover every question that you may have, we hope that you find the answers for most of your questions or concerns. If you don't find the answers you need, please call us at (630)903-6800 and we will be happy to help. A: There is no charge for set. However, additional fees may apply for delivery service area. A: Yes, but once again, please be aware delivery fees may apply. Q: Does the standard 6-hour rental time include set up time? A: That depends on how many rentals we have that day. Generally, we arrive half hour to four hours before the rental time begins. If we have a lot of rentals that day, we may need to set up as early as four hours in advance. If this is the case, we will call at least 24 hours before your event to confirm that someone will be at the party location. A: No. Bounce Houses R Us cleans and disinfects after every rental. If we are super busy and the inflatables have been rented and used all weekend, we will clean your inflatable on-site before you use it. We make it our mission to provide you with clean, safe, rentals 100 percent of the time. A: Yes. A blower keeps air in the inflatable unit the entire time. Once unplugged, the inflatable will deflate. That's why we require an outlet within 100 feet of the unit, or a generator. Longer cords can pop your circuit breaker, so we supply you with our own heavy duty cords. Q: What about setting up in parks? Do parks have electricity? A: We love setting up at Illinois Park Districts, Cook County, and Dupage County forest preserves, but most parks do NOT have electricity. If you want to set up at a park or forest preserve you must rent a generator. We rent generators at a reasonable cost, and they can be found in the tables/chairs section. You will also need a certificate of insurance, which we provide for a $45.00 fee. A: At Bounce Houses R Us, we accept cash, as well as all major credit cards. We do take company checks, park district checks, and checks from churches. If paying by cash, please have exact change, as our drivers do not carry cash. A: Yes, all orders require a $50 credit card deposit. Your deposit is non-refundable, but if we have to cancel due to weather you will be given a credit towards your next rental that is good for one year. If you cancel for any other reason the 50.00 is non-refundable and no credit is given. Q: What is your policy if there is inclement weather? A: Inflatables cannot be used if there are winds of 20 mph (15 mph for some items) or more, and cannot be used in the constant rain. The morning of your event, we will monitor the weather to see what is predicted in the forecast. If there is a 50 percent chance or more for rain, or a prediction of winds 20 mph or above during the time of your event, we allow you to cancel the day of your event. If you decide to cancel your event, it must be prior to delivery. You will be able to get a credit that may be applied to your future rental. You MUST call us before 7 am the morning of your event to cancel and to receive your full credit. Please note: we MUST keep safety in mind at all times, so Bounce Houses R Us reserves the right to cancel your rental due to inclement weather at any time. If there is a 50 percent or greater chance for rain during the scheduled time of your event, you may cancel or reschedule your event before 7 am the morning of the scheduled delivery. However, if the forecast is calling for scattered showers, we recommend you continue with your scheduled delivery. If the forecast is for continuous rain throughout the day, we recommend you cancel or reschedule your event. Inflatables cannot be used in winds exceeding 20 mph (15 mph for some items). If the forecast is for high winds, we will call to cancel/reschedule your rental. You will be able to receive a full credit if your event is canceled, to use it towards a future date with in one year from the date of cancellation. All inflatables can be used in a wide range of temperatures, but if the temperature is expected to fall below 32 degrees at any time during your event, we will call the morning of your event to cancel/reschedule your delivery. You will be able to receive a full credit to use toward a future date within one year form the date of cancellation. Keep in mind the children's activity will keep them very warm, and we recommend you continue as scheduled if the temperature is forecasted to be above 32 degrees. Deposits will not be refunded for temperature cancellations above 32 degrees. A: Most of our moon bounces (all of our character jumps, for example) are 15 feet by 15 feet, which is a little bigger than what other inflatable rental companies offer. Please take note of the space required for each unit (listed near the large picture), as some are VERY big and require extra space. When in doubt, measure your space to make sure it will fit. Units need room to be staked, as well as room for the blower, and they can't rub against walls or trees, as this may damage the inflatable. The sizes listed with each unit include the space needed for all of the extra equipment. If you have stairs or a tiered backyard, please call our office to discuss options for setup. Q: What about the really big inflatables? Any special requirements? A: Check the requirements listed with each unit. Also, make sure you have at least a four-foot wide access to the area where it will be set up. The units can weigh up to 650 pounds, so we need a clear path with ample room. A: We can set up on grass (our favorite and best for the kids), asphalt, and concrete. For asphalt and concrete set ups, you will need to order a sandbag rig. We cannot set up on any type of rock, as the constant rubbing may wear through the vinyl material. A: That depends. You are not responsible for normal wear and tear on our units. While we frequently inspect our units, seams may develop tears in high-traffic areas. If this happens, please alert us at once so we can remedy the situation. If, however, damage occurs due to failure to follow our safety rules or negligence (i.e. not turning off the blower in high winds) you will be responsible for all damages, including replacement of the inflatable, blower, and any other necessary parts. We don't want you or us to be in that situation, which is why we have you sign and initial on all of our safety rules, allowing you to be the trained operator.